View www.georgelewisclassiccars.com for more photos of this 1965 CHEVROLET CORVETTE CONVERTIBLE, Bright Red with Black Genuine leather interior, Black soft top in excellent condition, matching red hard top with new weatherstrip, Crate engine is a 6.2 L Cubic Inch Stroker with 435 Horse Power, Tremac 5-speed Transmission with original type shifter, knock off wheels with new radial tires, electric antenna with AM/FM Stereo, headlights and all instruments work as they should, repaint with Bright red base / clear with beautiful gloss. 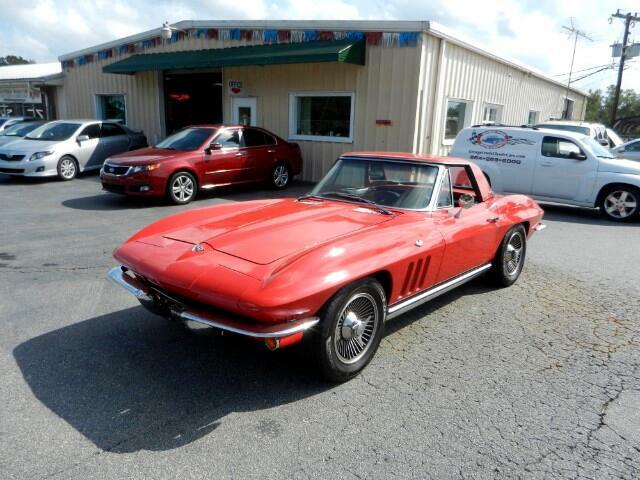 This 1965 Chevrolet Corvette Convertible with hard top is above average, and very fast,***REDUCED TO SELL @ $52,995. ***** Call Duane Wilson @ 1-866-959-4037, or 1-864-269-6000, or email us for a test drive appointment @ glewisclassiccars@yahoo.com. YOU WILL LOVE THE FRIENDLY GEORGE LEWIS AUTO SALES CAR BUYING EXPERIENCE! FIND OUT FOR YOURSELF WHY OUR AUTOMOTIVE SHOPPERS LIKE SHOPPING WITH US.